Take a close look at the Joey Dunlop Replica SP-1 on show at the Ally Pally right now. It could be worth £40,000. Bids are being invited on the first example of a limited run of 26 of the machines, and they have already soared past the £14,300 reserve. It is now on display at the MCN Ally Pally Show, where it will remain until the show closes on February 3. You can place your bids in a box placed next to it. Tippetts Honda of Surbiton, Surrey, the dealer which is selling the other 25 machines, said it expected at least £40,000 to be bid for the machine before the auction closes on May 31 because soon this will be the only Joey-replica you can get your hands on. Already, 16 of the other 25 machines have been snapped-up and there have been enquiries from all over the world, including the United States, Australia and Thailand. The value of the auction bike is boosted even further by the fact it carries the historic number " 26 " for his record-setting TT wins, on its headstock along with an inscription reading " 2000 Ultra-Lightweight " – to commemorate Joey’s final TT win, which came in the Ultra-Lightweight category for 125cc machines. 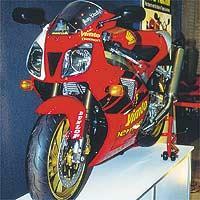 Joey’s own Y2K TT-wining SP-1 is also on display in the " Paddock Display " area of the MCN Ally Pally Show. •To bid for the Dunlop replica, either visit the Ally Pally or put your bid in writing to us. Proceeds of the auction will go to Dunlop’s widow Linda and children Donna, Julie, Gary, Joanne and Richard. Send your bids to: Joey Dunlop SP-1 Auction, c/o Emma Maddison, MCN, Media House, Lynch Wood, Peterborough Business Park, Peterborough PE2 6EA.